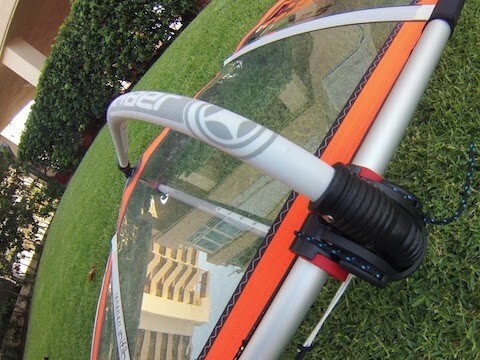 Windsurf MagazineWHAT MAKES A GOOD KIDS OR LEARNER RIG? WHAT MAKES A GOOD KIDS OR LEARNER RIG? 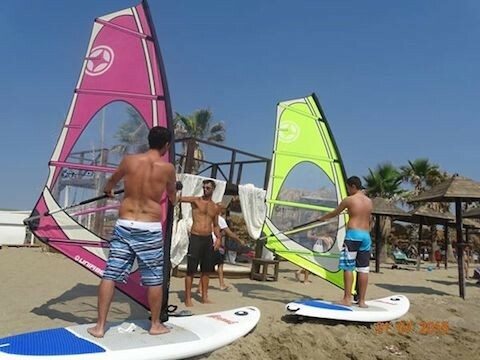 Whether you’re a parent or a windsurfing school, choosing rigs for learning to windsurf can be a complicated. So what should you look out for to make sure beginners have an easy, fun time on the water? With the help of some leading schools, stores and centers we’ve come up with these tips to help you make the right selection for both kids and adults. If you’re desperate for your kids to love the sport you do, then you may have to swallow some pride as – for the very first steps – it’s always best to send learners to an experienced school or camp where professionals can teach them. Kids also learn best in groups and without pressure from parents – at least for the basics – and will thank you for it when they stick with the sport for life. A lot of instructors will also tell you that kids can give up more easily if Mom and Dad are watching, so leave them to it and come back once they’re hooked! If you do teach anyone by yourself, don’t pressure them, ‘keep ‘em keen’ and make sessions short – and stop before the fun ends, especially if the wind’s too strong or the equipment too heavy. If kids want to switch to building sandcastles instead, let them. They’ll come back to it in their own time. SMALL, LIGHT AND WHAT ELSE? We can assume ‘small and light’ are standard qualities – but what specifically makes some rigs better than others? Thijs Surfschool in The Netherlands have years of experience with introducing people to the sport and say the number one consideration is strength. ‘For us this simply means Dacron, since kids step on and fall on the sails constantly, which monofilm just cannot handle. ‘Of course they have to be light too, since the kids have to uphaul a lot and the lighter the sail, the bigger sail they can use. ‘One other feature is simplicity during the rigging process. This should be as simple as it gets, so kids can also learn how to set up a sail. ‘Lastly – it’s better for sails to come with carbon masts on sails above 2.5 sqm. for enhanced performance without damage from bending. THANKS TO UNIFIBER AND THEIR CUSTOMERS FOR THEIR ASSISTANCE IN PRODUCING THIS FEATURE. LEARN MORE ABOUT THEIR UNIQUE KIDS RIGS. Of course locations can vary, but if you’re running a school in a harsh sandy, high UV area with salt water your rigs will wear faster than in a freshwater lake in lower light – so Dacron copes better with wear and tear in most environments. Monofilm sails can give great stability and work very well in super light wind when Dacron does not ‘fill’ so early – but it is forgiving to beginners, so many schools offer a mix of both. Experienced instructor Bart Van Es , who’s worked multiple seasons in the sun in Curacao, rates film sails but agrees they are not as durable. ‘But for adults – and sizes over 4.5 – film is much better’ he adds. Film can also be superior to Dacron sails without battens, but fully-battened Dacron rigs are hard to beat. Most instructors will select a rig for kids based on their height, so in the sizes that overlap kids and grownups usage, the biggest thing to look for is range in the height of the boom cutouts. Adults also benefit from a ‘real’ sail outline/profile rather than a ‘squashed’ or triangular sail – plus they tend to progress better with monofilm sails. So apart from the size, the profile, handling and durability requirements are the same, especially as you get the progression stage. WHAT DO THE KIDS WANT? According to Yvan Alie from the busy Au Vent Fou center in Quebec, Canada, ‘Kids just want a sail that looks like a ‘real sail’. ‘They don’t want to use triangular, old-fashioned rigs that are uncool. Tero Nieminen from TWind, Finland agrees. ‘Dacron sails, so long as they are fully battened like a ‘proper’ sail, give the best option for feeling soft and forgiving as well as delivering strength. 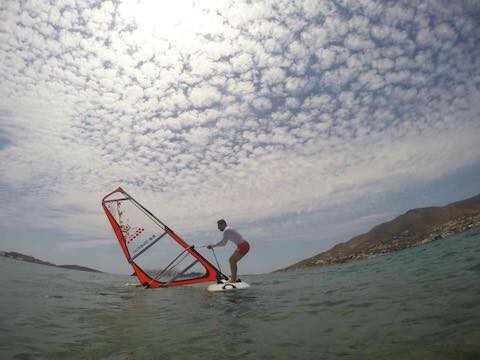 Bart Van Es confirms this but points out that ‘kids learning to plane need sails with a ‘proper’ profile’. 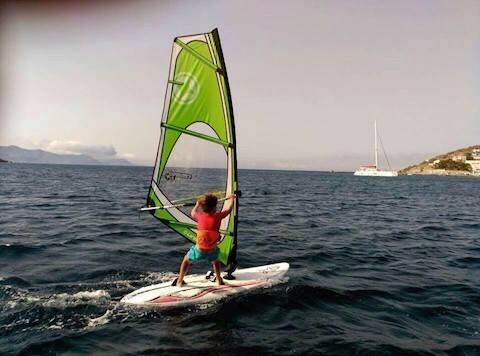 When it’s time to go solo and buy your kids first rigs, Thijs Surfschool usually advise parents to buy a sail one size larger than the one they last used in their lessons. Again, check the sail you choose has enough ‘growing room’ in the boom cutout and some range for younger brothers and sisters too. You can use small wave sails – and this is probably better for adults that are slightly heavier, but bear in mind some kids rigs have specifically designed, tighter leeches that promote early planing for those learning to use the straps and harness. Au Vent Fou make a good point that ‘on sails up to 3.5 they’re not in planing territory. ‘When they’re stronger they can use small wave sails – but there’s nearly twice the weight between a 3.5 wave sail rig and a kids rig so choose carefully’. Once the straps and harness are mastered, a sail with in-built leech twist is better and some brands have dedicated, 4-batten kids progression sails to consider. Always check with your local store and rig the sails up first to see how the leech behaves or if the masts are strong enough for extra downhaul tension as well as comparing overall weights. And what about price? Do you have to buy the best or the cheapest? 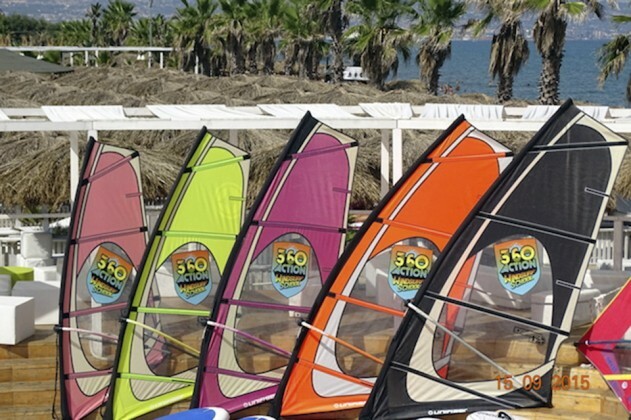 Action 360 from Sicily advise that buying cheap can be an advantage as you don’t know how long the kid will need the sail or how long they’ll stick with the sport. For kids there’s not need to buy a dedicated leaner’s board – just choose something they can master the intermediate planing skills on that will be more exciting for them as they develop. Smart Investment: Of course strength is a major part of protecting your setup costs. 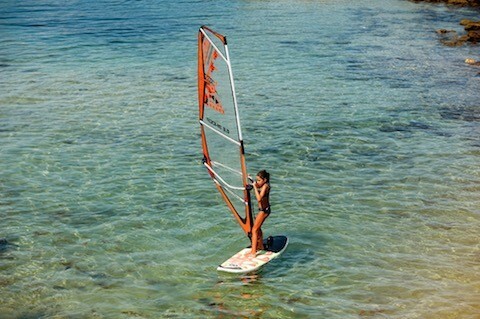 Gigi Madeddu is an experienced coach and center owner at freestyle hotspot SaBarra, Sardinia, where he has nurtured countless youngsters into the sport. ‘You have to get at least 2 – and preferably 3 – seasons in the sun and sand otherwise you’re losing money. ‘That means a selection of Dacron rigs are mandatory’ is his critical advice. Standout from the Crowd: Sometimes a stretch of beach has loads of schools so it pays to buy a different brand to what everyone else is using and to choose models with bright colors. Mix of film and Dacron: Stock a mix. Super light wind suits monofilm and adults often learn faster on film sails too. But make sure rigs are fully battened whatever you choose for maximum versatility. Dacron is more forgiving and soft in gusty locations and lasts at least two, if not three times longer. Value for money: Buy the best quality and ‘bang for buck’ that you can afford to extend the lifespan – but also benefit from re-sale value to customers. We hope that helps you get the important people in your life into the sport. Now go and book some lessons – and then buy some end-of-season gear at a good price to enjoy the rest of this summer – and in the Spring!